Please Join Us For Friday Challenge #14! 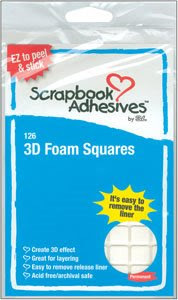 Scrapbook Adhesives 3D Foam Squares - IN STORE! 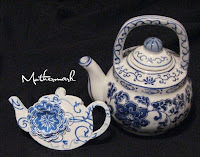 Teapot Tuesday #16 and a REMINDER! 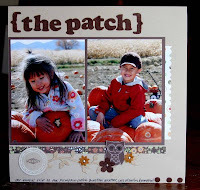 Bunches O' Buttons and an INVITATION! BasicGrey Wassail Rub-Ons - IN STORE! 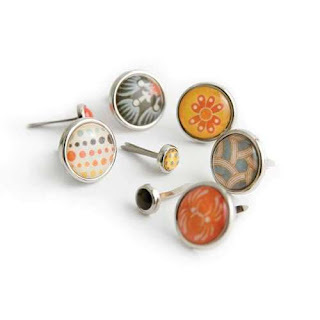 BasicGrey Glazed Brads - IN STORE! Imaginisce Fairest Of Them All Bling ~ IN STORE! 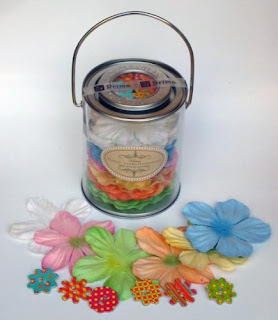 Princess Posies by Imaginisce ~ IN STORE! Join Us for Friday Challenge #12! 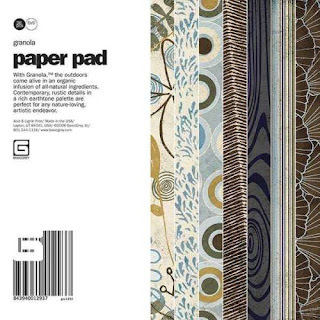 NEW Basic Grey Chipboard Albums IN STORE! NEW BasicGrey Collections IN STORE! Tiny Tea Pot Tuesday #14! 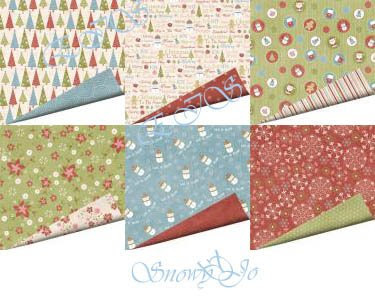 Imaginisce Snowy Jo Collection IN STORE! More Prima Flowers IN STORE!! 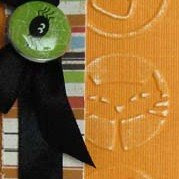 October Design Team Gallery Sneek Peek! Challenge: Feeling Like a Hollow Weenie? Details: Too many wrappers laying around from Hallowe'en? 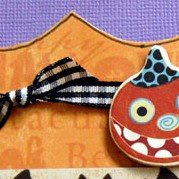 Reduce, Reuse and/or Recycle any type of craft packaging onto your creation! 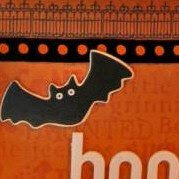 It's a Bonus if you use Hallowe'en packaging!! Please remember to use keyword FC14 if you upload to the gallery so we can see your recycled goodness! Check out the challenge gallery here! 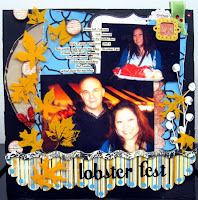 The 3D Foam Squares are ideal for adding dimension to your page. The squares are spaced for quick and easy removal of the sheet and the top liner is very easy to peel off. 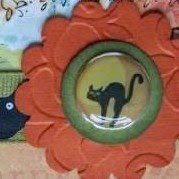 Great for all types of materials in scrapbooking. Acid-free Archival safe and PAT approval. 126 foam squares 1/2 x 1/2 inch OR 308 foam squares 1/4 x 1/4 inch. Join us tonight for a Copic Chat! Our Copic rep, Emily will be there to show us examples and give us tips! Tonight at 7 Mountain time, 8 Central, 9 Eastern and 6 Pacific time! 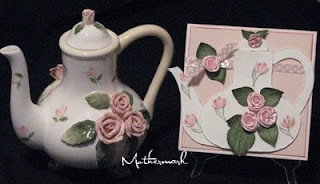 Cindy here is addicted....to TEAPOTS of all things!! So....she is sharing them to the world one tea pot at a time and so far we've seen 16 of them!! Since she hasn't invited us all over for tea...we'll just have to settle for getting together to make cards inspired by teapots!! Make sure you put TPT16 in the keywords section of your upload page! And now for the reminder....don't forget the COPIC CHAT on Thursday, October 30 at 7:00 Mountain Standard Time. What a GREAT opportunity to get all your Copic Questions answered! Come one and come all.....the more the merrier!! More information here. 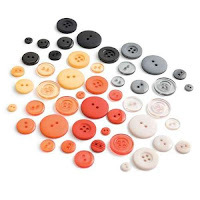 Beautiful Buttons by BasicGrey....each package has 66 buttons with 6 different colors and featuring new clear buttons too! 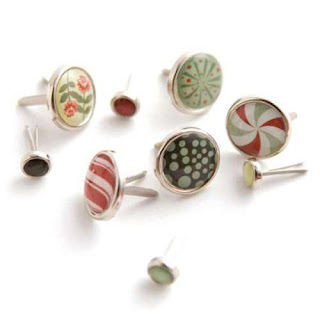 These coordinate with the paper lines....check them out!!! We'd also like to invite you and ALL of your Copic-lovin' friends to join us for a Copic Chat with EmilyLaurel, our Copic Representative! What: A Copic Chat.....come with all of your questions if you're a newbie or even a Copic wannabe! Where: Right in our forum...c'mon in and join the fun....we're a friendly bunch! RSVP: If you can join us, please be sure to let us know where you heard about this awesome opportunity...whether it is here, on a Design Team Member's blog or on a Customer's blog....we want to know! Let us know in this thread! 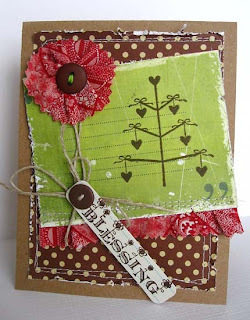 It's time for Friday Challenge 13 with our Hostess: Heidi. 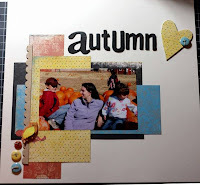 Challenge Details: Create a layout or card using cardboard. 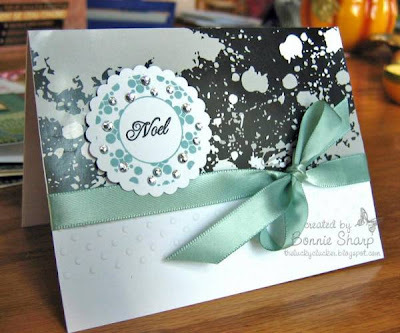 Stamp with it, cut it into shapes, paint it, distress it! Just have fun! Be sure to use keyword FC13 when uploading your card so we can all find it! 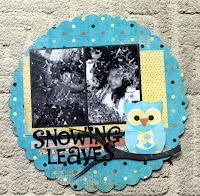 To view the challenge cards in the gallery click here. It's Teapot Tuesday and this week we have a Pretty Polka Dot Tea Pot for inspiration. Have you ever seen such lovely jewels? How dazzling! 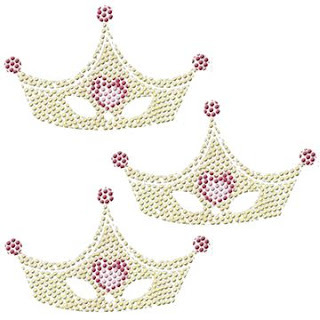 These sparkling rhinestone brads framed in silver will make all your projects fit for a queen! Close your eyes… Make a wish… Think of pretty flowers and hearts and a royal crown. Your most wonderful wishes may have just come true! 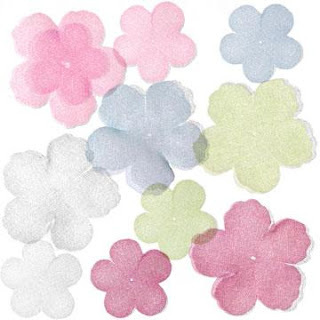 Just outside the castle walls in an enchanted garden with magical blossoms in six pastel hues. Here’s a pretty posy for a pretty princess! Layering sheer flowers results in a darker color. It’s magical! And if by any chance you can't get by with out each and every color.....there's a solution for you too! 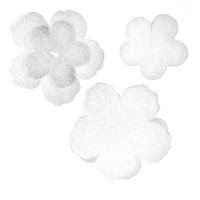 A variety pack of flowery goodness!! Check it out! 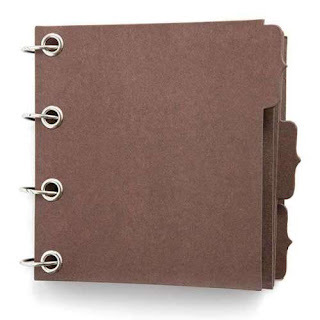 Check these out....Tabbed Milk-Chocolate Chip and Tabbed Dark Chocolate Albums by BasicGrey! With Granola, the outdoors comes alive in an organic infusion of all-natural ingredients. Contemporary, rustic details in a rich earth-tone palette are perfect for any nature-loving artistic endeavor. 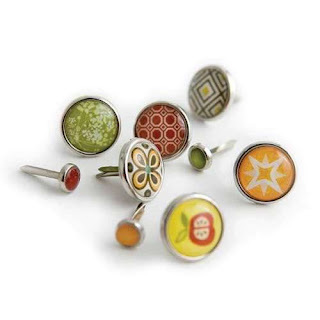 Urban Prairie is a rich bounty of fanciful patterns bursting with folk appeal. 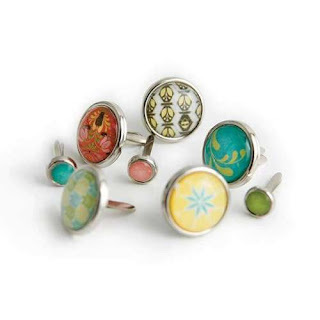 Elaborate, whimsical designs partner with a bright kaleidoscope of colors, popping with accents of black. 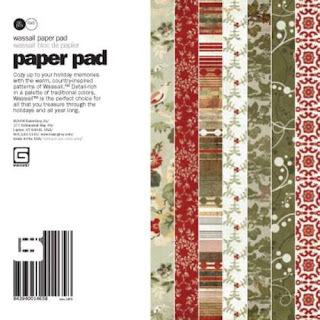 Cozy up to your holiday memories with the warm, country-inspired patterns of Wassail. Detail-rich in a palette of traditional colors, Wassail is the perfect choice for all that you treasure through the holidays and all year long. Ooh....this stuff is so drool-worthy! Go grab yourself a cuppa Wassail and Enjoy! It's Teapot Tuesday and Cindy had a tiny teapot for us this week! 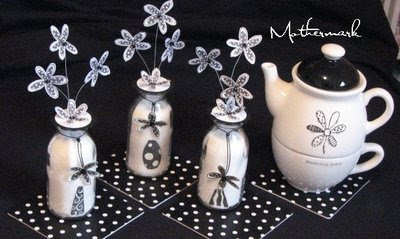 This challenge is where we make cards inspired by teapots. The rules for this challenge are easy because there are none! Make sure you put TPT14 in the keywords section of your upload page! 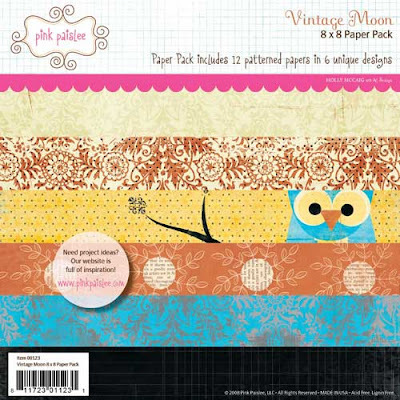 Every once in a blue moon a collection comes along that will have you crafting into the wee hours of the night. 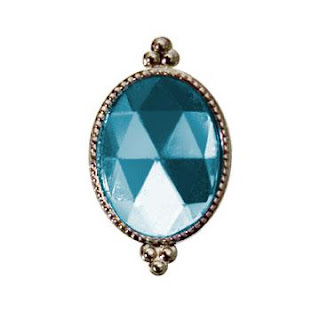 The Vintage Moon collection will turn you into a night owl for sure! I've been checking out the gallery and it seems it's been keeping a few of you up late too!! 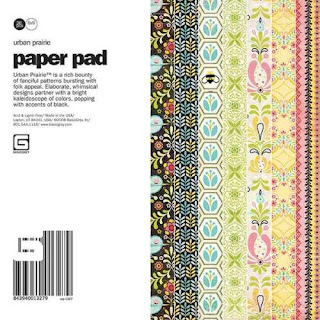 Lots of fun stuff with this paper line! Here is what you may have missed! Please leave the ladies some love in the gallery!! Join us for Friday Challenge #11! 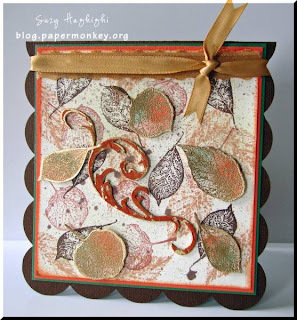 The Details: Create a fall card using flourishes of any kind- stamps, hand drawn, die cuts, chipboard - whateva! 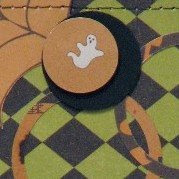 Bonus points if your card or layout is Halloween based! The Bonus: Prize Alert!! 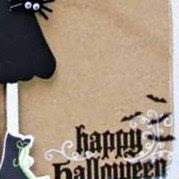 - One challenge participant who makes a NEW card just for this challenge will win a small prize package featuring 2 Imaginisce Hallowhimsy stamps and samplers of Eye of Newt Brads, Bump in the Night Brads, new Prima Halloween flowers, and a few rub-ons! There will be a random draw next Friday so be sure to use the right keyword so Suzy can find your card to enter it! Start singing the Hallelujah Chorus! 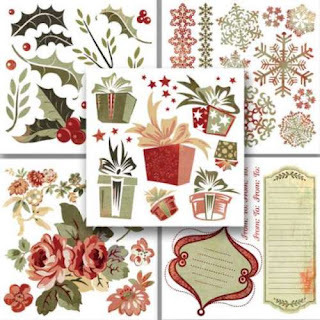 These sparkling papers are cause for rejoicing with their double-sided cardstock, cozy winter colors and glittering accents. It’s the best Christmas ever! The rules for this challenge are easy because there are none! 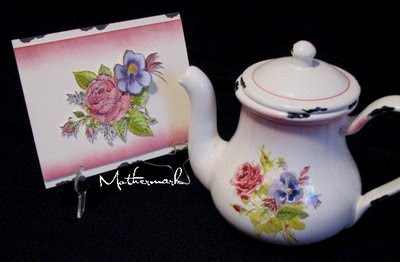 Just check out the teapot above and make a card with your inspiration! No rules, no deadlines, just have fun and thanks for joining us for Tea this Tuesday morning! Check out the thread here for challenge chit chat! 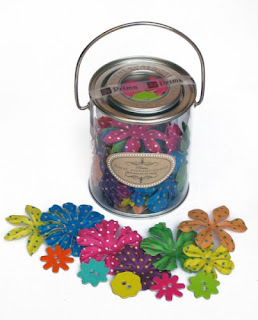 Check out this Minnie Can of small polka dotted flowers by Prima Marketing. 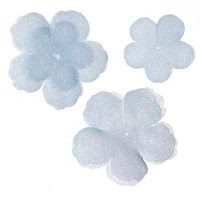 These lovely paper flowers come in a cute 4 1/2 x 3 3/4 inch re-useable container! Flower size is approx 2.5 inches. Also available is this Minnie Can of large flowers. 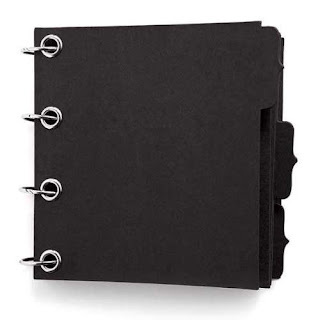 These come in a 3 1/2 x 4 1/2 inch re-useable container as well. 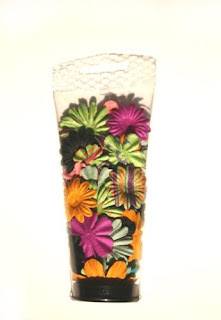 You recieve 1 container filled with flowers and chipboard buttons. Flower size is approx 3 inches. 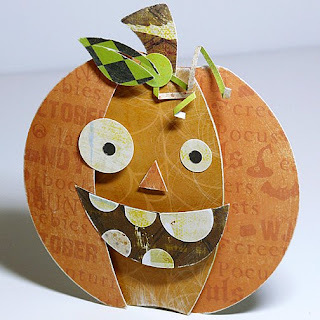 Design Team Gallery Open: Halloween Monster Mash! It's 5th of October and that means the Design Team's 3rd gallery is open for viewing! 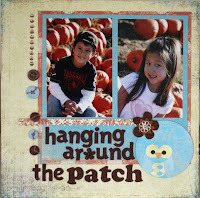 This month design team member Ching chose the gallery theme. 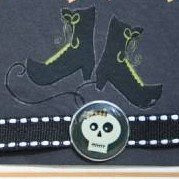 The Details: Make Halloween projects that will make everyone feel at "tomb" by hosting a ghostly gala full of fun loving spooks and festive chills. Happy Haunts everyone! 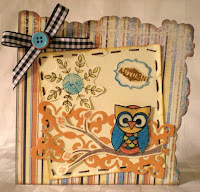 PaperSquares joined the Design Team as our Guest Designer this month....check out her work above and in the gallery! Welcome to Friday Challenge #10! The Details: Fall is my favorite time of year. I love the rich colors and the crisp air. 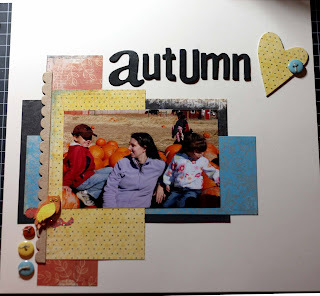 Create a layout or card based upon this sketch using your favorite fall colors. Make sure the layout is crisp and clean. 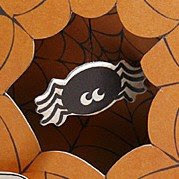 Soooo.....if you're in the mood for some Hallowhimsy....stop on by on October 5th to check out the spooky creations in the Design Team Gallery! 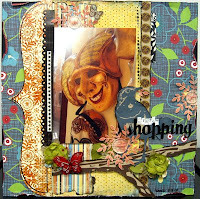 as our Guest Designer...and her creations are Spooky-cool!